When Is A Dose Not A Dose? When is a dose not a dose? When it’s a dose rate. Confused? You’re probably not alone. Since the dawn of smart pumps (circa 2002), infusion therapy providers have programmed their continuous drug infusions by entering a value that describes how fast the drug is to be delivered. But just like an automobile’s speedometer calibrated in miles per hour, this programmed value is a speed or rate. An engineer will say the programmed value is the amount of drug to be delivered per unit of time – a dose rate. It’s also consistent with a volumetric infusion pump that is programmed to deliver a volume of fluid per unit of time – a flow rate. The side effects from this semantic error interact with other infusion labeling. What do you call the drug amount in an infusion bag that is given intermittently? Isn’t that a dose too? When beginning a course of treatment, it’s not uncommon to infuse an amount of drug rapidly to achieve a therapeutic level. Isn’t that a dose? Sometimes the only way to differentiate between dose and dose rate is by inspecting the units of measure that accompany the value. 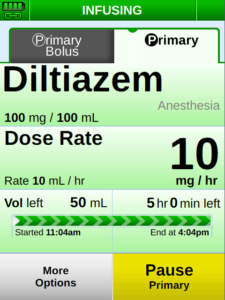 For example, one can give 10 mg of diltiazem (a dose) or give 10 mg/hr of diltiazem (a dose rate). Unless both are given over an hour, the result will be very different therapy. ECRI reports that “‘wrong-field’ programming errors occur relatively frequently (though such errors often go unreported).” Similarly, ISMP reported that “dose-rate confusion during pump programming” was the second most frequent error cited in a survey of smart pump usage conducted with 1,008 nurses and pharmacists2. So, why does this ambiguous labeling exist in smart pump user interfaces for programming infusions? A sample screen display from the Ivenix Large Volume Pump that shows prominent dose rate labeling for the programmed infusion. It would be tempting to blame smart pump design teams who might have truncated label lengths to accommodate small screen sizes by using dose instead of dose rate. However, the issue appears to have roots with how nurses and pharmacists have been trained to perform infusion calculations. The Ivenix Large Volume Pump is a smart pump that recognizes the critical distinction between dose and dose rate and uses this labeling consistently and prominently throughout its programming interface screens. Together with the rate units of measure, this “dose rate” labeling helps users to distinguish among various programming doses on the pump’s user interface. 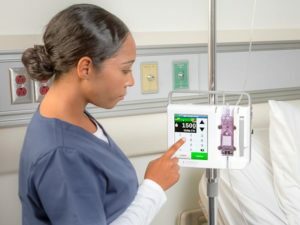 At Ivenix, we understand sometimes a small change that makes technology more intuitive and easy-to-use can make a big difference in enhancing infusion pump safety and reducing medication administration errors. Eric Smith is the Principal User Experience Manager at Ivenix. Eric is an engineer and human factors specialist with over 30 years of experience developing safe and easy-to-use medical technology. 2 Smart pumps in practice: Survey results reveal widespread use, but optimization is challenging. ISMP Medication Safety Alert! Acute Care, April 6, 2018, Vol 23 Issue 7. 510(k) pending. The Ivenix Infusion System is not commercially available in the U.S.